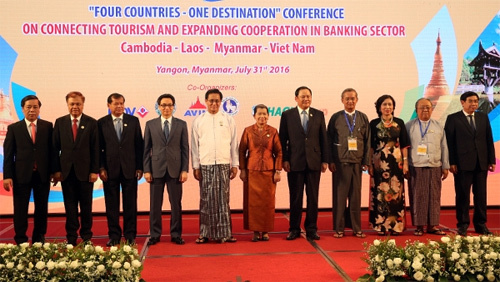 Deputy Prime Minister Vu Duc Dam attended the forum “Four Countries – One Destination”, which aims to promote co-operation in economics, tourism and investment between Cambodia, Laos, Myanmar and Vietnam, in Myanmar on July 30-31. The forum brought together over 500 representatives from the four countries, including Cambodian Deputy Prime Minister Men Sam An and Lao Deputy Prime Minister Sonexay Siphandon. Deputy PM Dam was accompanied by representatives from the Ministry of Culture, Sports and Tourism and the State Bank of Vietnam. Participants discussed potentials and opportunities for the development of sub-regional tourism, co-operation in building common products and strategies to promote tourism, building infrastructure and developing human resources to serve the tourism industry. They also deliberated integration and links in the fields of banking and finance discussed standards of the ASEAN Economic Community. Deputy PM Dam, together with Vice President of Myanmar Van Thio, Cambodian Deputy Prime Minister Men Sam An and Lao Deputy Prime Minister Sonexay Siphandone attended the opening of a branch of the Bank for Investment and Development of Vietnam (BIDV) and the opening of the Melia Hotel-Hoang Anh Gia Lai in Yangon./.